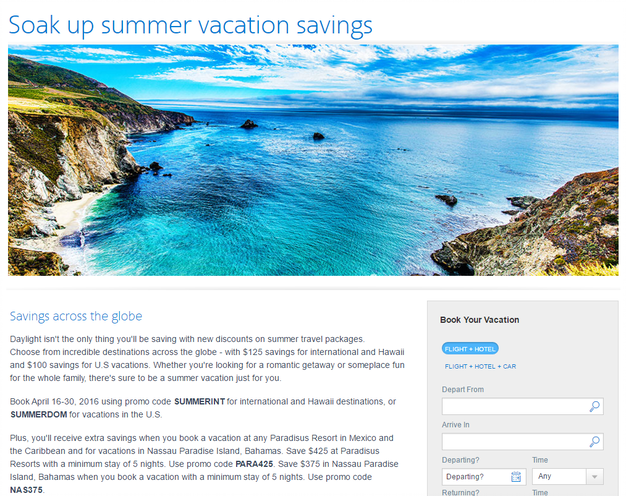 American Airlines Vacations is one of my secret places to check for great flight deals when these type of packages fit my travel plans. 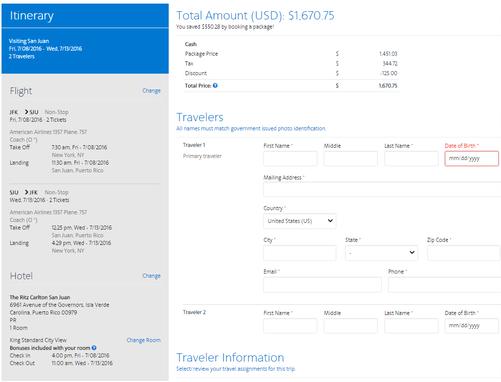 While you can earn airlines miles by booking with the usual Air + Hotel package sites like Travelocity and Orbitz, American Airlines Vacations often has promotions for bonus AAdvantage miles when you book directly with them. Also, I have snagged some amazing deals on packages when combining flights and hotels in one booking. I’ve even seen flights and hotels combined price out hundreds of dollars cheaper on AA Vacations than on AA.com or Google Flights for flights alone!Right now, AA Vacations has a nice promotion for flight and hotel packages of at least 5 nights. Often these promotions are targeted at a specific resort brand or destination. The nice part about this promotion is you can use it to book any package of at least 5 nights. International or Hawaii packages will receive $125 off and domestic destinations will receive $100 off.Book April 16-30, 2016 using promo code SUMMERINT for international and Hawaii destinations, or SUMMERDOM for vacations in the U.S.For example, here’s a great deal for 5 nights at the 5-star Ritz Carlton San Juan, Puerto Rico, including round-trip airfare from New York JFK for $1670 for two people after the promotion is applied. Always doing comparison shopping as these may not always be the best prices. But it’s worth pricing out to see if you can snag a sweet deal on your next getaway!